Tom Brady throws three touchdowns in win over Miami. MIAMI GARDENS, Fla. (AP) — The New England Patriots finished the regular season with a perfect road record, and are hoping their next trip is to the Super Bowl. Tom Brady threw for 276 yards and three scores Sunday to help the Patriots clinch home-field advantage throughout the AFC playoffs by beating the Miami Dolphins 35-14. New England took a 20-0 lead in the first half, and turned away Miami’s comeback bid with the help of a 77-yard touchdown catch-and-run by Julian Edelman and a 69-yard fumble return by linebacker Shea McClellin . The Patriots (14-2) were already assured of a first-round bye but played all-out, as coach Bill Belichick had promised. “It’s just important to keep that foot on the gas pedal,” Brady said. New England became the ninth team since 1972 to go undefeated on the road during the regular season. The Dolphins (10-6), beaten for only the second time in the past 11 games, had already earned an AFC wild-card berth and will play their first postseason game since 2008 next weekend at Pittsburgh. That made the thumping by New England much easier to take. If the Dolphins beat Pittsburgh, they’ll face New England again in two weeks. “Can’t wait,” Dolphins receiver Jarvis Landry said. 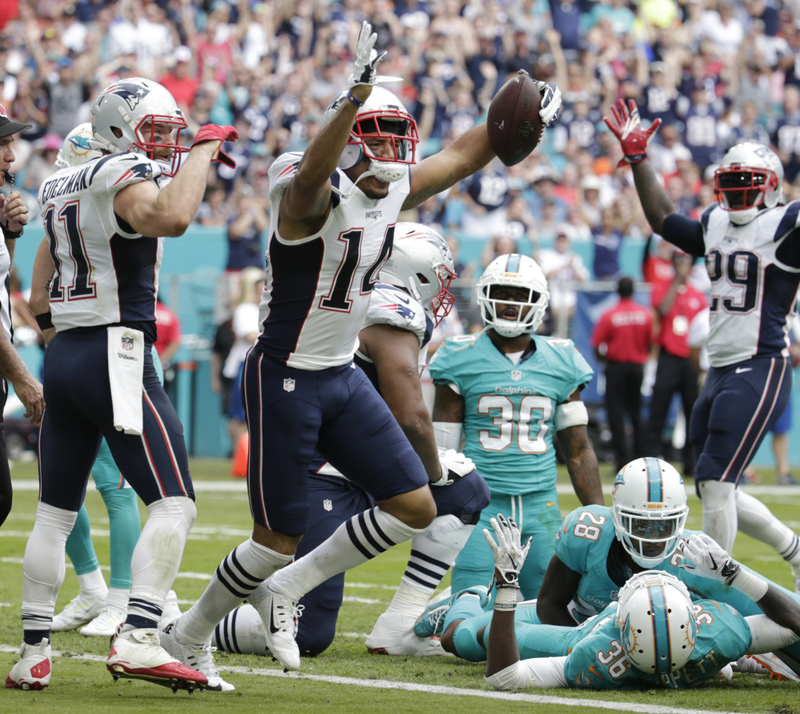 After Miami mounted consecutive 75-yard touchdown drives to make it 20-14, Edelman caught a short pass from Brady, broke free thanks to a crushing downfield block by Michael Floyd and scored on the longest reception of his career. When the Dolphins threatened early in the fourth quarter, Devin McCourty forced a fumble by Damien Williams, and McClellin returned it 69 yards to set up a touchdown for the game’s final score. The Dolphins were steamrolled by a Brady-led offense that wasn’t forced to punt until late in the third quarter. Brady went 25 for 33 with no turnovers . Edelman had a career-high 151 yards on eight catches. Miami’s Jay Ajayi went to the X-ray room after the game but said he was fine. He ran for 59 yards and finished his breakout season with 1,272. Floyd scored his first touchdown with the Patriots when he caught a short pass and powered into the end zone for a 14-yard score to make it 14-0. Floyd was acquired last month after the Cardinals released him following a DUI arrest in Arizona. Brady increased his career yardage total to 61,582 to surpass former Dolphins quarterback and Hall of Famer Dan Marino for fourth place on the NFL’s career list. Next is the Saints’ Drew Brees, who went into Sunday’s game with 65,761 yards. Patriots: The Patriots swept the regular-season series against Miami for the first time since 2012, and could now face the Dolphins in consecutive games. If the Dolphins beat the Steelers, they’ll play at New England the weekend of Jan. 14-15.